So these cars came up on my radar. 300Sd is the model name. I think one would be perfect for my commuter car. I don't know much about them other then they are a pretty robust vehicle. 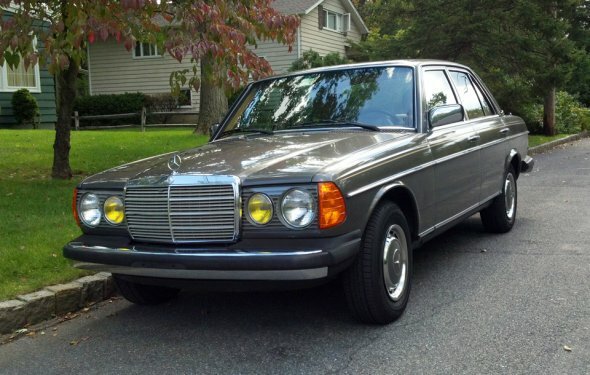 I'm not particular to which style W123 (? ), 124 or126.but would prefer a wagon. Any info would be great! I owned a new 84 SD 4, 000 lbs and 125 HP just does not cut it. That car completely turned me against MB. When you call them a slug you are being kind. Originally Posted by sunsprit I worked on many of these cars for customers and personally owned 10 of them ... 300Dt's, 300CDt's, and two of the 300TDt's, and one 300SDt. the engines were bulletproof only to the extent that they got routine servicing with top quality diesel rated oil/filters. Many of these cars didn't get such maintenance treatment, and were driven with dirty oil, restricted air and fuel filters, and had many other routine maintenance items neglected. Typically, the cars that I saw that delivered high mileage were serviced every 3, 000-4, 000 miles. Transmission fluid and filter changes were essential every 20, 000 miles, diff lube changes were every other trans fluid change, and many detail items were overlooked by shops (including dealers ... I had one local MB dealer whose techs didn't know there is a filter in the power steering reservoir that must be replaced every 20, 000 miles and the service writer even argued with me that such an item even existed). I've had dealership techs call me up with 300Dt poor starting/running problems that couldn't even be bothered to verify a clean air filter in a car that was totally black on the filter and the air filter rubber isolation mounts were all broken. Most dealer techs I knew wouldn't adjust the valves on schedule because it was a dirty nasty job to do; I "fixed" a lot of poor starting/running dealership maintained cars by doing nothing more than properly adjusting the valves and installing new filters. "nailing" sounds were frequently cured with a fuel tank dose of BG44K or LubroMoly diesel injection cleaner; I always pre-filled the spin-on fuel filters with ATF to help strip out the injection pump deposits. On top of these major engine longevity issues, these cars suffer from a multitude of system problems. Vacuum cells, hoses, switches, and check valves in the central locking system are problematic. Climate control systems are a never ending series of failed heater modulating valves, hot water circulating pumps, control panel controls, and related components. The cruise control systems, switches, actuators were a failure in the making. Window regulators, switches, and motors had a high failure rate. A/C cooling capacity was weak at best and struggled to keep up with the car interior comfort on a hot sunny day ... and that was on R-12; if the car is changed over to R-134a, it will be very marginal if you live in a climate where A/C cooling is essential for comfort more than a few days per year. The OE Behr plastic radiator tanks were problematic, with failures at the hose inlets crumbling at the hose clamps or the tank a common item; the replacement aftermarket metal radiators didn't have the same cooling capacity and would often lead to overheating ... especially for the trans oil cooler temps. The heater output was inadequate for BTU's to keep the car interior warm and the windshield defrosted in our Rocky Mountain climate winters. The windshield washer nozzles were a frequently plugged up item; I never understood why this happened on these cars because using the same winter fluid as I used in my other cars, they didn't plug up. I kept a piece of fine wire on hand to poke the stuff out while somebody was squirting the washer system to flush it out. Just about every car that came in for service, I'd check this item and clean them out; oft times, a new check valve in the washer hose was needed, too. The washer pumps were a persistent failure item. The little round "computer" which drives the tachometer was a common failure item, too. You either learned to ignore the non-functional tach or paid the bucks to restore the function. I used to buy these by the case; takes only a few seconds to install on the left fender socket. Steering damper shocks were almost a routine replacement item. Again, something we checked on normal maintenance intervals and frequently replaced. I bought these by the case, too, to keep them on hand for my customers. Fan Hubs were a common failure item, and water pumps weren't especially long lived. Few techs ever bothered to check the oil level in the injection pump; I think few even knew that this was a routine maintenance item. As well, the "cigar hose" fuel return hose was a failure item in diesel fuel, and was a common maintenance item (often replaced with straight fuel hose, which doesn't have the noise damping of the cigar hose). This stuff contributed to early injection pump failures. The fuel senders were notorious for getting growth on the resistance wire and not giving good readings; this again could be solved by cleaning, but how many cars have this problem? The instrument cluster was another failure item. I replaced a couple hundred of the power supply capacitors in the clocks when they failed to run or keep time; most shops would simply sell a new clock ($$$). The odometer gears would strip on the shafts and the odo's failed at surprisingly low mileages; many would read lower mileage than traveled for awhile before totally failing. The speedo heads themselves would develop loud squeals in cold weather which required lubing the drive cable and the speedo back input bushing.